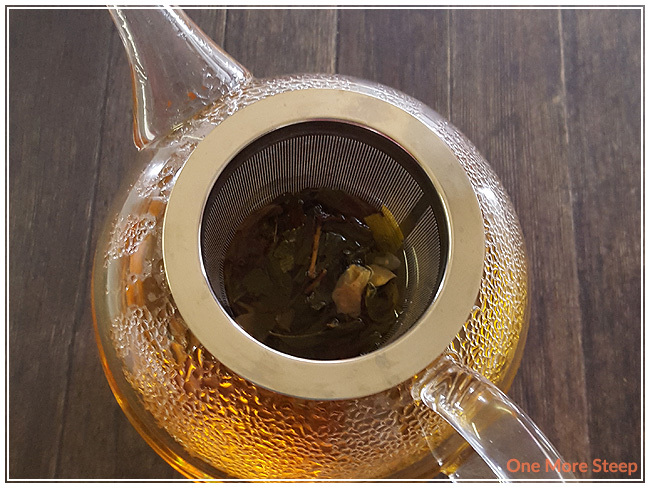 The dry leaf of Three Wishes smells heavily of green tea and peaches. I can’t smell roses or the black tea base at all, but that’s not too terrible because I like the smell of peaches. The dry leaf looks interesting, there’s sunflower petals in there as well so it’s a pretty tea to look at. 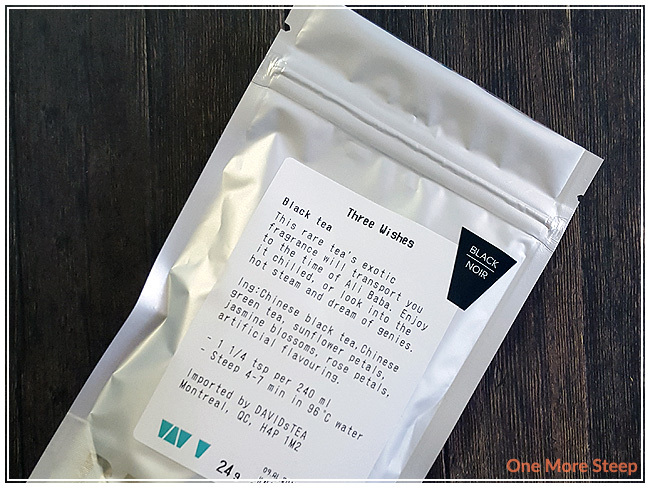 Three Wishes is categorized by DavidsTea as being a black tea, I think this is because black tea is listed first in the ingredients. The ingredients are: Chinese black tea, Chinese green tea, sunflower petals, jasmine blossoms, rose petals, and artificial flavouring. DavidsTea recommends steeping this tea in 96°C (204°F) water for 4-7 minutes. This might be accurate if the tea only contained a black tea base, but it doesn’t. Green teas need to be steeped in cooler water for a shorter period of time or else it’ll oversteep and be a very bitter cup of tea. I steeped mine in water that was about 85°C (185°F) for about 3 minutes. Three Wishes steeps to a deep golden yellow, which is quite pretty and very aromatic. The tea smells purely of peaches and green tea – I can’t smell the black tea at all. The taste of Three Wishes is a bit surprising. It tastes of melon (perhaps honeydew?) and peaches, along with the green tea base. There is no trace of the black tea, roses, or jasmine taste in the tea at all. Which is a bit disappointing, given the ingredients, but it is a very pleasant cup of tea. The peaches taste is delightful, but the tea by itself is not very sweet. I added a bit of sweetener to brighten up the peach flavour and it worked out quite nicely. I think this tea would do very well as an iced tea or cold steeped, and would probably taste quite good in the summer time. I attempted to resteep Three Wishes. Unfortunately, the taste of the melon and peaches does not hold up well. 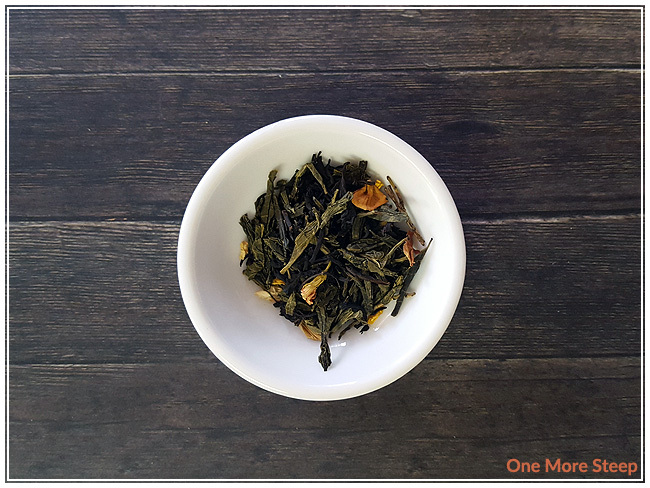 The taste of the green tea still overwhelms the black tea base, and I’m still missing the floral component. The second cup was definitely not as enjoyable as the first steep, I would not recommend Three Wishes for one more steep. I thought that DavidsTea’s Three Wishes was just okay. Three Wishes makes for an interesting tea, because only a portion the ingredients are detectable in the steeped tea. I would have ranked it a bit higher if DavidsTea had given more appropriate steeping instructions. I suspect that if you follow the steeping instructions as-is that you’d end up with a very bitter cup of tea and would wind up throwing it away. 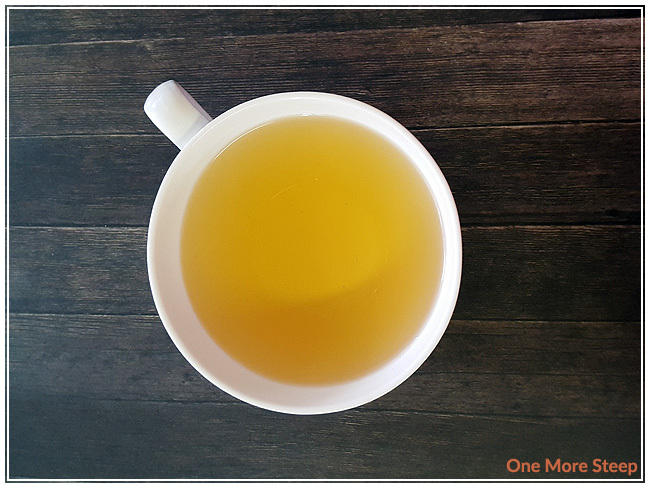 As it stands, Three Wishes is a tasty tea with a great fruity taste to it. It doesn’t do well with resteeping, but would likely do well iced. I do recommend steeping it at a lower temperature for a shorter period of time – life is too short to be drinking bitter tea.